It is well known that swimming and non-weight bearing exercises can build muscle and increase range of motion. Sometimes in miraculous ways. The physical healing that occurs in water is well understood. However, there are other aspects of healing that occur in water that are less understood. Warm water with the safety and comfort that it provides, leads to an emotional peacefulness and sense of well being for all involved. This component alone is often what’s needed to reverse a negative path. A dog can tap into a part of your heart that few can reach. When our canine friend is hurt or paralyzed, there is a feeling of loss, fear, and despair that reaches to depths that seem unbearable. I have an empathy and understanding of this borne out of personal experience. It is so important at those times to keep our faith, remaining thankful for the learning and bonding that is about to occur. It is often in times of tragedy that life gives us our greatest gifts. The chance to unwrap this gift each and every day is what makes my dream and the reality of the Doggie Dome Swim Spa so satisfying. I thank you all for loving so unconditionally the animals in your life. Maintain health year round with a consistent exercise program. Your dog will have fun getting into shape and losing those extra pounds. 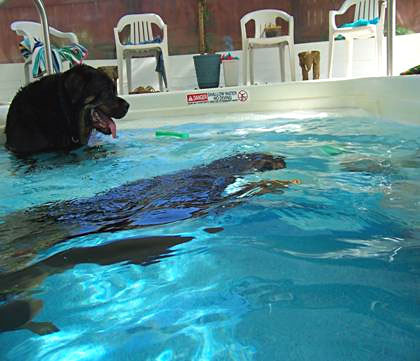 Puppies, Puppies, Puppies-teach them to swim and condition them without the fear of stressing their still growing bones and joints. The temperature of the water is kept at 90 degree’s. Warm water increases blood flow and relaxes muscles improving range of motion. It feels wonderful. The body is subjected to greater pressure in water than out of it. This squeezing pressure increases both lymphatic and venous return from the limbs, helping to clear the metabolites from muscle and connective tissues, rendering the body more amenable to stretches. The raised levels of blood and lymph entering the right atrium of the heart slows it down, producing a calming effect, also favorable to stretching. Beyond this, the equal and omni-directional pressure in water stabilizes joints, making stretches safer. The pool measures 17 feet x 27 feet. Plenty of room to exercise or swim. An all natural water treatment system keeps the pool healthy, non-toxic, non-irritating, non- allergenic, and odor free. Free of chlorine and bromine. Gentle on fur. No red or irritated eyes. The system is the same one used on the space shuttle. The pool is enclosed in a building. Your dog is safely contained and no bugs or dirt to contend with. The building gives a relaxing tranquil atmosphere with soft music to swim by. There is seating for you to watch your dog enjoy his session or you may sit on the outside and still see your dog through the windows. I supply a drying system for you to dry your dog and extra towels. Life jackets are provided for those that need them. Come visit the spa. You and your fury friend will be comfortable, and have an enjoyable, relaxing experience rain or shine.